Far beneath me my daughter Sophie gives an unwitting squeal, Henrietta’s twins shriek in unison and I hear son Josh call out ‘Mummeeee!’ when as much by luck as design my left arm catches a forked limb long enough for me to grasp it and come to a bone-jolting, shoulder-wrenching stop. Sweat drips down my body, my knees shake uncontrollably and something’s poking between my ribs like a sharpened spear, causing an actual hole through clothes into flesh. Dangling, I somehow hook one leg round the main trunk and cling there like my life depends on it. Which, for the record, it does. ‘Hang on, Mum!’ Sophie yells for perhaps the fifteenth time. She’d wanted to climb up here but I’d told her it was too dangerous. When will I listen to my own advice? I stop panting long enough to call down. ‘I’m OK, sweetheart. Perfectly safe.’ How long since I last clambered up a tree? Me, an overweight, unfit middle-aged, mother-of-two in not so skinny jeans. And what did I promise my family – that I’d avoid potentially risky situations? That any cases I took on would absolutely not involve capturing murderers or exposing criminals? Not that our patch of North London known as Crouch End is inundated with killings, just that I’ve somehow succeeded in entangling myself with two in the last eighteen months. And now the simplest of mundane jobs has turned an everyday school drop-off into what could possibly be my final farewell. A terrified glance below shows Sophie clutching on to her younger brother’s arm, their long-standing feud forgotten as they contemplate their mother’s plight. Lauren, Henrietta’s eldest by two seconds, is hopping from foot to foot, pale with anxiety while her sister’s nervously studying her watch. I wonder what’s upsetting them most – the thought of Aunty Cathy’s untimely demise or being late for class. Yet again. Disregarding me entirely, he licks his paw before stalking further out, balancing on a twig, with the arrogant grace of a tightrope walker. Oh how I wish I’d ignored him when I saw that distinctive white-tipped tail swagger across the zebra crossing. But I’d spent weeks scouring backyards, crawling on hands and knees, peeking under parked cars, over hedges, listening to sweet old Mrs Thompson choke back sobs as I admitted failure. I’m gathering my courage and strength to scale higher when my mobile rings. I wedge my bum into a crevice between branch and tree, tighten my hold and, with a few contortions worthy of the great Houdini, extract my phone from my pocket to peer at the screen. Caller’s number withheld. Should I answer it? Am I in any position to answer it? Several months back I’d been donated this money, you see, ten thousand pounds, which was kind of hot, but gone cold. Semi-illegal – not to be returned. Brilliant timing as my husband, Declan, had recently re-evaluated what he wanted from life: Rhode Island Reds and a less pressurised career, I’d been suspended from work and my house cleaner, Pimple, was tired of domestic duties. I was thinking maybe it’s time I should do some soul-searching. So we, as in Pimple and myself, decided to start up a business. We’d originally substituted the would for might, because after all, how can one predict who’ll kill themselves? Some people threaten it with no intention of going through with it and others, not a word and then boom – lives are devastated. Then there’s those who talk about it all the time and no one gives a hoot because they’re labelled attention-seekers and before you can say boom again – they carry out what they’d always said they’d carry out. ‘Is that the police?’ There’s a fearful edge to the woman’s voice. Or perhaps she’s merely anxious to be heard over the noise. I glimpse through the branches, hearing cotton rip as I lean forward. A huge red vehicle’s speeding this way, lights blazing. Sophie’s small face gazes up at me, expression distraught in the strobe lighting, finger pointing in my direction. ‘PERHAPS I’D…’ I find I’m screaming into the phone as the siren abruptly cuts out. I turn away from the cluster of grinning helmeted and booted firemen assembling at the foot of the tree as someone cranks up the ladder. Fluffy takes one look, turns tail and bolts down the other side. I modulate my voice to more professional tones. Perhaps I’d better ring you back I’m about to suggest politely, but too late. She’s gone. ‘Yes, I’m here.’ I swiftly hide the nail polish, climb into my swivel chair and wire myself up to the Skype headset. She ducks down, sits back seconds later clutching a wide-toothed comb and starts tugging vigorously at her tight curls, turning them into a helmet of grey frizz. ‘That’s better.’ She drops out of sight again, emerging with pencil in hand. ‘Now update on yesterday?’ She licks the lead tip. My business partner, former cleaning lady and long-time friend. I both love and hate her enthusiasm for news. Love that she’s still interested in our work even though she’s travelling the globe on that luxurious cruise ship. Hate that I’ve nothing of interest to convey and am very likely letting her down, business-wise. ‘Shouldn’t you be in bed?’ I say, having lost track of the various time zones she’s travelled through. ‘That’s right.’ I’m always amazed by her memory for detail. ‘Phooey!’ she scoffs. ‘Oldest trick in the book, that one. Bringing out the ancient threadbare purse. You’ll need to wise up, Cath. Those houses on the Ladder are worth a bomb. What else?’ Her pencil’s poised above her pad. I run through our list of jobs, which takes precisely three minutes as apart from our two ex-clients, there’s only the newsagent who contacted me yesterday to ask if we’d investigate who’d been stealing his papers and a schoolkid called Ben who’d rung Monday to say his new mountain bike had been nicked and the police weren’t doing anything about it. I’d asked him to wait a few days and if no joy to call back. ‘That’s it?’ She wrinkles her brow. ‘Looks like I’ll need a new mop when I get home, after all.’ She lets out a sigh that sounds like a steamship in heavy fog. Worse thing is she probably will. Money’s haemorrhaging faster than I can spell the word. We had to invest in the computer because mine was horrendously slow. Then there was the cost of stationery, surveillance equipment, etc. – all the paraphernalia needed in setting up. At least office space is free. We’re based in Pimple’s Edwardian semi-detached home, couple of miles down the road from Crouch End. Seemed daft forking out when she had a spare room – perfect to shove two desks in. It’s where I am now. ‘Oh I’m sure that won’t—’ I stop. Because there’s a ploppy sound and she disappears into the ether, like Endora from Bewitched. I wait a few seconds, see if she’ll reconnect, but nothing. No need to call back. We’ve both said what we had to. The phone, the one all prospective clients are meant to call, is staring at me accusingly. I pick it up. Check it’s still working. Could be a fault and hundreds of sad souls have been trying to connect. Crying out for help. I listen a second. Strong, healthy brrr. By the time I turn into our drive around five thirty, I’m bushed. Rest of the afternoon had been spent clearing up the newsagent’s problem. I’d arrived at his shop, introduced myself, politely listened to his plans for an elaborate stake-out and then suggested we first have a good delve around the shop floor, back room and the flat above. Bingo. Turned out, his elderly widowed mum was nicking the papers and hiding them under her bed. Early signs of dementia at a guess but at least that’s that one solved. For us anyway. Frankly it was too bloody efficient. Less than an hour’s work but the poor guy’s got a long hard journey ahead. How could I possibly charge him? On the other hand, I scold my ineffectual self, I need to toughen up. Do I really want to start again on a job-search? I hang up my jacket by the porch and trudge through to the kitchen. Declan’s standing over a saucepan which is bubbling away on the six-ringed range cooker which dominates our good-sized, somewhat country-style, kitchen. A heavenly tomato-ey aroma permeates the air. Everything’s worked out great for him. He’s ridiculously happy with his new postman’s job. Has to leave home at five a.m., but he’s always been an early riser so never minds. Gets bags of exercise on his assigned pushbike, and he finishes mid-afternoon, in time for the school run. Never mind that it pays half what he earned before. It’s the quality of life that counts, right? Plus, best part, I have dinner waiting for me every weekday evening. All those years of wedded bliss with me muddling along, running out of recipes and not really being faffed and now he’s completely taken charge of the cooking. Wondrous. He always says this and I always tut and do an exaggerated who-gives-a-monkey’s shrug. Not that I’m averse to owning chickens. Can be rather relaxing squatting outside their coop, watching them scratch the earth and vie for pecking order. And Josh and Sophie wake themselves up early each morning to see which hen’s laid what, which is a heck of a lot better than me screeching at them to get out of bed. Plus free anything’s great with my almost non-existent wages, but I don’t like admitting it, because he bought them without consulting me – his wife. Then again, at that time, he was acting weird and buying other things without consulting me too. Like our super-expensive oven, which we’re still paying off. Male menopause, my insurance broker reckoned. But we’re over that. Back on an even keel. Perhaps not financially but definitely hormonally speaking. ‘Where’s the kids?’ I slump onto a chair and watch him stirring, tasting, stirring again. I watch him as he adds a spoonful of paprika, dash of Worcestershire sauce then a variety of fresh and dried herbs. He’s tall, few inches over six foot, gingery-brown hair, blue eyes. Irish born and bred, although you’d never believe it from his London accent. His body’s still good for his forty-three years. Actually, tell a lie, his body’s fabulous, but that’s only because he gets to spend afternoons in the gym while I’m slogging away in my office. We’ve been married a little over eleven years. Not saying there’s been no ups and downs in that time, but the ups far exceed the downs. My friends all consider him Mr Wonderful and sometimes I do too, even though I maybe don’t say it often enough. ‘So how was the gossip at the school gates this afternoon?’ I ask. Just after eight and I’m sitting back at the kitchen table, now set for one sole diner, after doing the bath-bed-book-lights-out routine. Declan’s preparing a salad and I’m enjoying a quick cuppa before heading off. ‘Drugs,’ he says, dicing a carrot. ‘That.’ He nods at a letter on the sideboard behind him. I can’t imagine. Love my kids’ school but they’re famous for blowing the slightest unsettling ripple into a tsunami of alarm. ‘Yep, and William was with him.’ He tosses the tomatoes into a bowl, adding a drizzle of olive oil. That confirms it. ‘My oh my. Knowing that family, I’ll bet it was something hideously toxic – like a Diet Coke. Or a powdered doughnut.’ I’m not too familiar with Pip, but I’ve seen him around, being the elder brother of Josh’s ex best friend, William. Once inseparable they’ve recently gone their separate ways, or rather Josh dumped William for another classmate. Slightly mortifying because I often bump into William’s mum at morning drop-off. Truth be told, though, if someone’s heart had to break over an early bromance, then I’d rather it wasn’t my kid’s. Is it my imagination or does a cold wind suddenly whistle through the kitchen? ‘Pretty much. Managed to close a couple of cases.’ Hopefully he’ll assume that means money in the bank. ‘Good for you. Hang on a second, what’s that?’ He leans towards me and begins tugging at my hair, emerging with a tiny twig between his fingers. ‘Thanks.’ I take it from him. ‘Very blowy outside today. Oh what’s that?’ I pick up a magazine lying on the Welsh dresser and leaf through pages of bucolic landscapes, slightly uneasy at the way he’s watching me – kind of sideways, mouth quirking. ‘Isn’t that rats?’ He laughs. 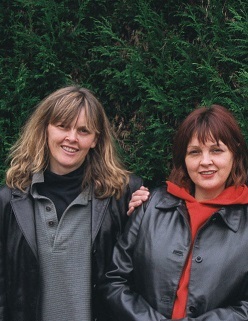 Ellie Campbell is a pseudonym for sisters, Pam Burks and Lorraine Campbell, who write together from their respective homes in Surrey, England (Pam) and Colorado, USA (Lorraine). After years of selling short stories independently, they began their Ellie Campbell collaboration with a first novel, How To Survive Your Sisters, followed by When Good Friends Go Bad, Looking For La La, To Catch A Creeper and Million Dollar Question. They write contemporary women's fiction laced with humour, romance, and mystery. Meddling With Murder is their 6th novel and follows Looking For La La and To Catch A Creeper in the funny, cozy ‘Crouch End Confidential’ mystery series. Prize: 10 Ebooks of Meddling With Murder by Ellie Campbell. Open worldwide to those who can legally enter. Winning Entry will be verified prior to prize being awarded. No purchase necessary. You must be 18 or older to enter or have your parent enter for you. The winner will be chosen by rafflecopter and announced here as well as emailed and will have 48 hours to respond or a new winner will be chosen. This giveaway is in no way associated with Facebook, Twitter, Rafflecopter or any other entity unless otherwise specified. The number of eligible entries received determines the odds of winning. Giveaway was organized by Njkinny from Njkinny Tours & Promotions and sponsored by the author. VOID WHERE PROHIBITED BY LAW.